With the recent killing of Morgan Earp by assassins, Wyatt Earp spends his 34th birthday attending to the details of shipping his brother’s remains home to California. With Morgan’s body safely out of the territory, Wyatt, his younger brother Warren, Doc Holliday and two other hand-picked men accompany Virgil Earp (who is still weak from an assassination attempt in December) and his wife Allie to Tucson. Guarded by Wyatt and his men, Virgil and Allie are transported by buckboard to Contention City where they board the train. Switching trains at Benson, the party has a little over an hour ride to Tucson, and it is dusk as the passenger train slows down for its approach. Tucson is lit up as the city’s modern gas lighting system has been turned on for the first time. Celebratory shots can be heard as the engine glides into the station. Under the veranda of the brand new Porter Hotel, Ike Clanton and Frank Stilwell watch the passengers detrain. 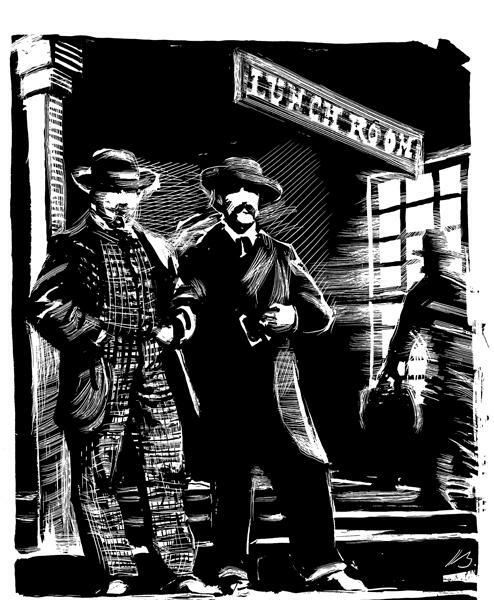 Stepping off the train, Doc Holliday carries two shotguns, which he deposits in the depot office, as the Earp party makes its way to the dining room in the Porter Hotel. 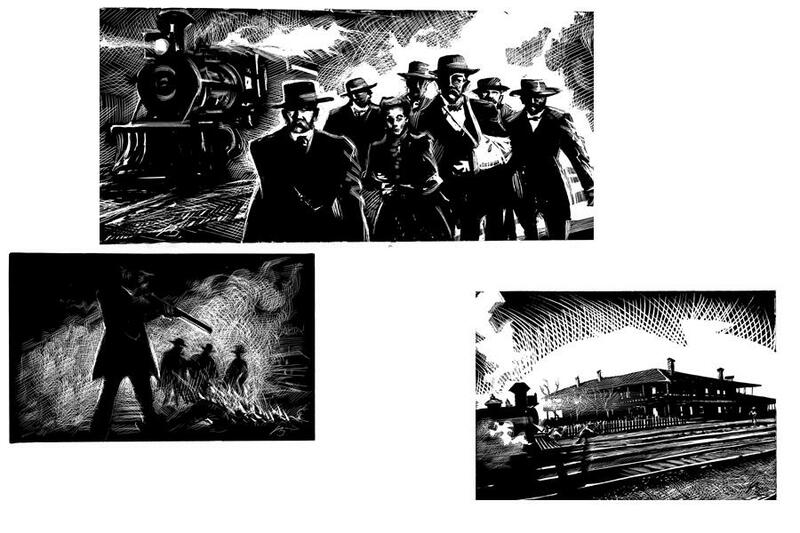 After finishing their meals, the Earp party walks back to the train and retrieves the shotguns from the depot office. Wyatt and his men say their goodbyes to Virgil and Allie, and are ticketed on an eastbound train for the trip back to Benson. While waiting for the train to move out, a passenger allegedly informs Wyatt that Stilwell and Clanton are lurking near the hotel and may plan on shooting Virgil through the train window as it goes by. 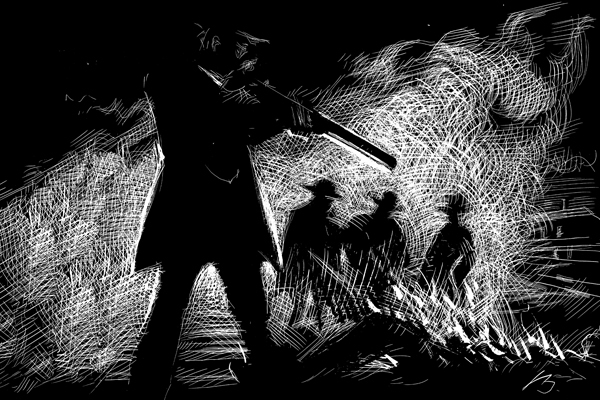 Bristling with shotguns and rifles, the Earp bodyguards, led by Wyatt, run down the train tracks, straight for Stilwell who is standing near the southeast corner of the hotel. Stilwell runs for his life. In the lead, Wyatt chases Stilwell for about 100 yards (saloon keeper George Hand claimed it was 200 yards). Other shots are heard, but many of the locals assume it is more of the gas light celebration. As the train carrying Virgil chugs out of the station, Wyatt runs up to the cars, holding up one finger and mouthing the words, “One for Morgan.” Virgil and Allie glide by in the darkness. Were Ike Clanton and Frank Stilwell Gunning for the Earps? Ike Clanton had been in Tucson for two weeks prior to the Stilwell shooting. Clanton and Frank Stilwell were witnesses in Jerry Barton’s trial before the District Court, and Clanton was allegedly at the train station to meet another witness named M’Dowell. Clanton was seated under the veranda of the Porter Hotel adjacent to the train station (see map, below), waiting for the witness to detrain when Stilwell approached and asked him to “go down town, as the Tombstone crowd [meaning the Earps, who had just arrived on the same train] evidently intended to kill him,” according to the March 22 Arizona Daily Star. Clanton initially refused, but finally, he and Stilwell “walked away a few paces … conversing for fifteen minutes.” During this time, the Earp party went into the hotel to eat. There is some debate as to whether Clanton and Stilwell were actually gunning for the Earps at the train station, but one thing is for sure: if they weren’t looking for a fight, they picked a pretty dumb spot to lollygag. Deputy U.S. Marshal J.W. Evans testified he saw Doc Holliday step off the train with two shotguns, which he checked at the railroad office. After the Earp party ate dinner in the Porter Hotel, Holliday instructed a shorter man (believed to be Sherman McMasters) to reclaim the weapons just prior to the shooting, Evans said. Because of the Stilwell shooting, Wyatt and his men missed the return train to Benson. 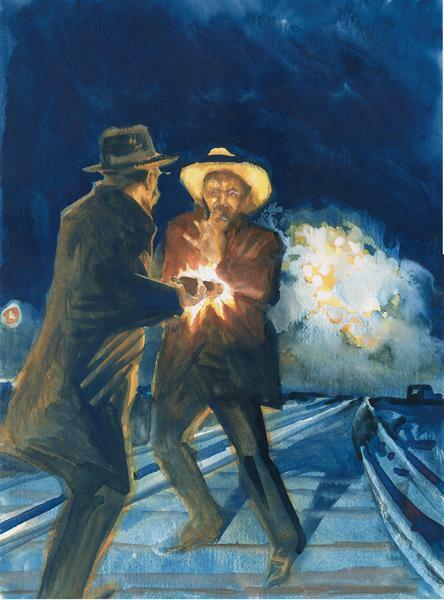 Wyatt Earp, Doc Holliday, Sherman McMasters, Turkey Creek Jack Johnson and Warren Earp footed it nine miles eastward along the railroad tracks to Papago station, and at midnight flagged an eastbound freight train. They took the train to Contention City and either reclaimed their horses or took the next stage into Tombstone. With Sheriff Bob Paul carrying warrants for Wyatt’s arrest, Wyatt was now a fugitive from the law. He quickly settled his financial affairs in Tombstone and began his so-called Vendetta Ride, wherein he and his men killed Florentino Cruz and allegedly shot and killed Curly Bill Brocius before fleeing to New Mexico and on to Colorado. The Earp escorts include Wyatt Earp, Warren Earp, Doc Holliday, Sherman McMasters and Turkey Creek Jack Johnson (above). After returning to the train, Wyatt spots Frank Stilwell near the corner of the Porter Hotel (left) and with three of his party, he gives pursuit. Catching up to Stilwell, Wyatt gives him both barrels. Three of the Earp escorts run up and take turns shooting at Stilwell’s prone body (below). Legend says the Earp party then spends two hours looking for Ike Clanton without success. Having missed the eastbound train to Benson, the escorts foot it nine miles to Papago station and stop a freight train at midnight for their escape. Two men watch intently as passengers detrain from Benson. One of them will soon be dead. 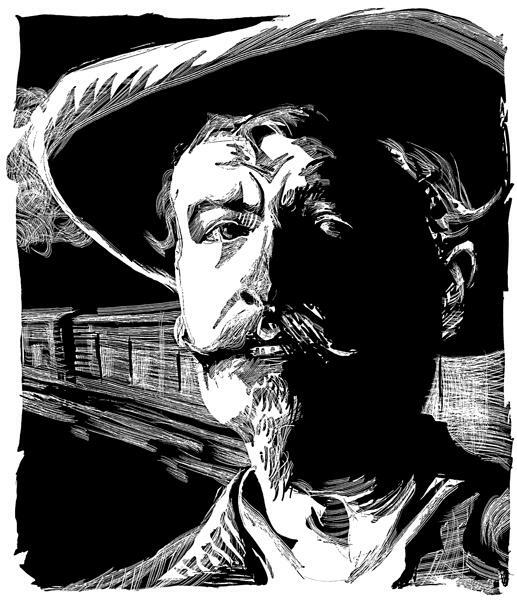 Ike Clanton misses the train to Hell. The train carrying the Earp party from Benson chugs into the newly built Tucson train station at dusk. The Southern Pacific built a modern, two-story depot with an adjacent hotel, all in wood, making the state-of-the-art buildings two of only several buildings in the Old Pueblo not made of adobe. The Earp party detrains in front of the brand new Southern Pacific depot (1), then walks to the Porter Hotel (2) for supper. Ike Clanton and Frank Stilwell are standing under the veranda on the southeast corner (3) next to the garden. The shooting takes place on the tracks northwest of the hotel (4). “Morg!” Frank Stilwell allegedly yells twice as Wyatt sticks his shotgun under Stilwell’s heart and gives him both barrels. Was a complete version of George W. Parsons’ diary of his time in Tombstone ever published? I think it would make a great read. 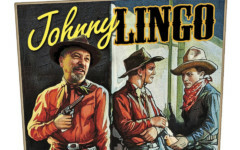 Johnny Lingo: What’s in a Name?